Jared Langley, present-day Duke of Reston, tumbles into an abandoned fountain on his ducal estate and travels back in time to the year 1816. There, Reston servants and local villagers think him a dead ringer for his namesake and rakehell ancestor–the seventh Duke of Reston, gone missing at the Battle of Waterloo. Unfortunately, Seven got mixed up with French spies out to assassinate the Duke of Wellington, and an unwary Jared ends up in their crosshairs. 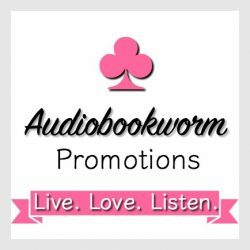 Lady Ariana Hart has loved Jared Langley, the seventh Duke of Reston, since she was twelve years old, until the night the rogue broke her heart. Given up for dead, her rakish neighbor makes a miraculous return from Waterloo–only Jared shows up a changed man and reignites all the feelings Ariana had long ago buried. Jared is in a race against time. He must waylay the suspicions of his quirky servants and neighbors, get to Wellington before the French spies do, fix his fountain–before Seven shows up–so Jared has a way home, and definitely not fall in love with the irresistible Lady Ariana. My Thoughts: I was charmed out of my boots! It’s nice to begin a book ready to snuggle into the couch and simply enjoy. The title is a little unusual, but I saw how it neatly fit into a story of time travel. McCarty captures the absolute ennui of present-day Duke of Reston, the thirteenth duke, Jared Langley. He is disgusted with how he’s pawned over by women, just to have the opportunity to get something from him. He’s beyond bored with making money. He has piles of it and does it buy him happiness? The only thing which has captured his interest lately is his fascination with all the other Duke’s of Reston who came before leaving their stamp of existence through their journals—all except the seventh. It all changes the day he finally tells his fiancée it is time to shove off. He isn’t interested in being pimped, or in the words of days-of-old cuckold by his fiancée. Walking into part of his garden he rarely uses to just get away and breathe, angered with life in general, he slips and falls…into a new life, back to the days of Duke of Reston, the seventh. Jared is busy juggling how to get back to the future after the fountain he’d hit in the present (falling through a portal) had been damaged and no material is available to repair it, his heart finding a woman he admires and respects, his run-ins with ‘accidents’ of sorts, where it was very unlikely. Jared, the thirteenth is no longer annoyed with life. The story with all its quirks of charm, danger and levity is so fast-paced, I wished it were longer, which brings me to waiting eagerly for the second in the series. If you love time travel, characters with noble hearts and a happy ever after, pick up this read and drop back into time where life is dangerous, but somehow more genuine. 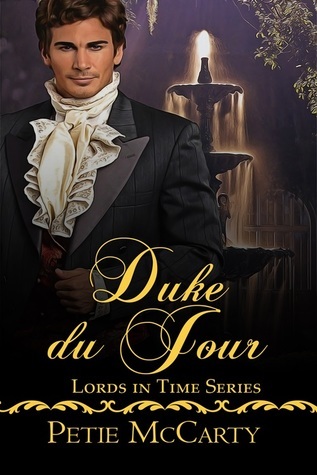 This entry was posted in Action/Adventure, Historical Romance, Suspense, Time Travel and tagged Duke du Jour, historical romance, Lords in Time Series, Petie McCarty, Time Travel. Bookmark the permalink. I read and reviewed this book too. I was drawn in to this delightfully humorous read from chapter one. I loved it too. Check out my review of this book. Thank you, Eileen! The Duke greatly appreciates your kind words and you taking valuable time to read and review the story! I wish you all the best!